Too much information on a day in the family life. Welcome back. OK, that was more for me than you, dear reader. So what does life look like around the Kelsey camp as winter approaches in 2014? Actually winter, which starts on what December 21st?, is a long ways off. 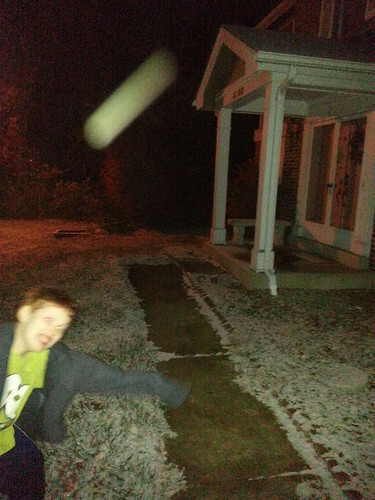 But last night we had the first snow that stayed on the ground for a bit. The pictures were taken as we headed out at 9:00 at night to go visit mommy at work. Yes, for the time being, Laura has taken a part time job to help us through this tight financial season when we have two and three kids attending academy and/or college. This year and next year we have one in academy, one in college. The following year we’ll have two in academy and one in college, the next year, um the 2017-2018 school year will be the top of the mountain. A sophomore in academy and a freshman and senior in college. That’s as bad as it gets. Then six straight years like this one at one and one. So a decade including the current school year. People say it will fly by. Who are these people, and can’t they keep their opinions to themselves? What was I talking about? Oh yeah, last night. So I spent most of my evening on the computer with tech support setting up yet another e-mail address. I told the boys we could go over at 8:00 pm, but that became more like 9:00. But since she was closing, she’d be there until well past midnight, there was no hurry other than we needed to get there and back before I was too sleepy to drive. Earlier in the day I had finished a proof of concept on creating a “plug-n-play” functionality for the hardware on the Deposit Kiosk I write software for. If you have a friend or family member in jail or prison and you’ve used a kiosk there to deposit some money for them, you may have well used the software I write! That’s exciting to me. The boys had homeschool and as our custom is they give me the rundown of the subjects they addressed and a highlight of what they covered. Hannah called, but she was going out for a moment and I said by the time she called back we would be out, so she’ll catch us tonight. And Joshua is pretty good about checking in, but last night he didn’t. So other than the fact that I finished something instead of struggled with a problem all day without resolution, it was a pretty typical day these days around our place. Thought you might be curious. Since both my mom and dad are trolling through this blog from time to time and they wonder if we’re doing anything. I thought it might not be a bad idea to try to revive this place with some of our activities. Today was a “blog worthy” day – here’s what happened. Since there was no set schedule we got what I consider a late start. We were at the bowling alley by about 11:00 AM. They put is at the other end from all the “experienced” bowlers. All the shoes were mushy and slipped right on (it wasn’t until we took them off that the notable smell associated with them was noticed). 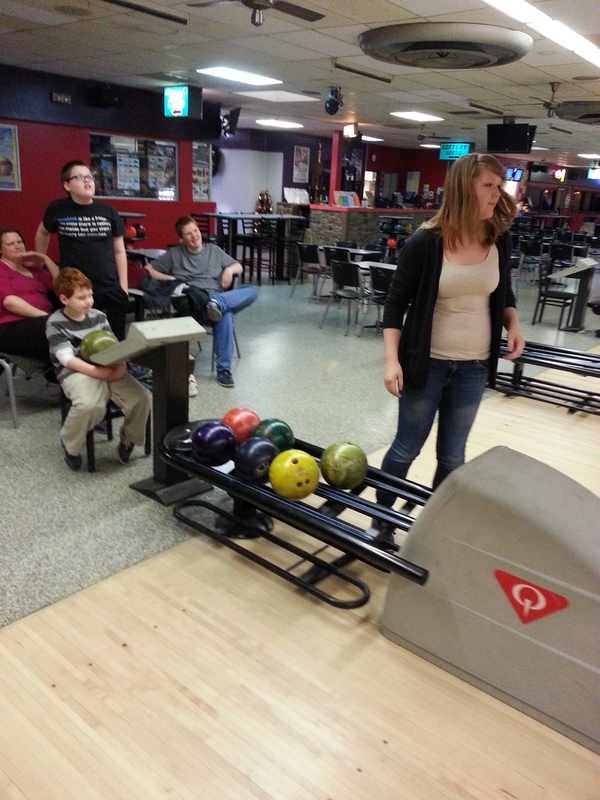 We bowled by age, so Nathan was under pressure to be the first one up. We swarmed around him giving him all kinds of conflicting advice. Everybody had their different styles. Joshua was getting into it. We had a lot of problems with the lane. Pins in the gutter. A wobbly 10 pin (often gutter balls on the right would knock that 10 pin over and you’d get a “freebie”). 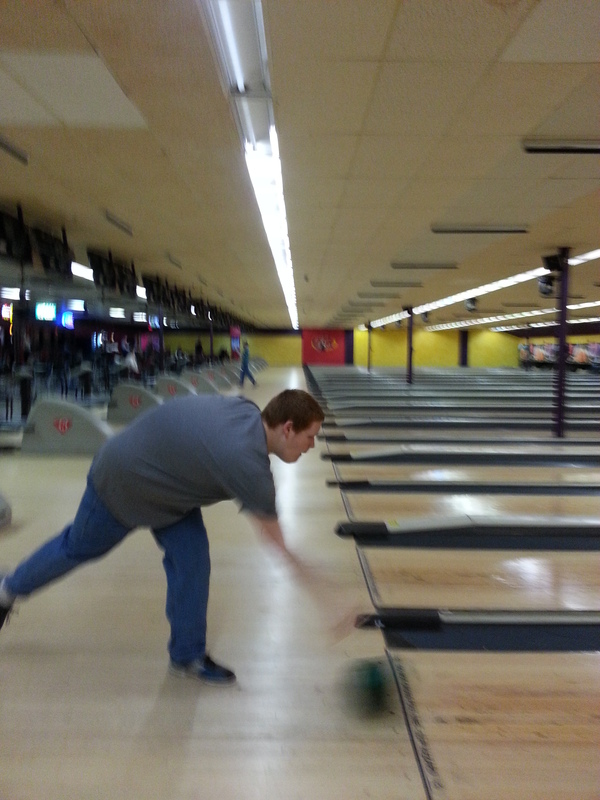 And then Nathan lost his temper and sent a ball down one gutter slow enough that it stopped. We tried to knock it with another ball with no luck. Needless to say, we were popular with the staff. 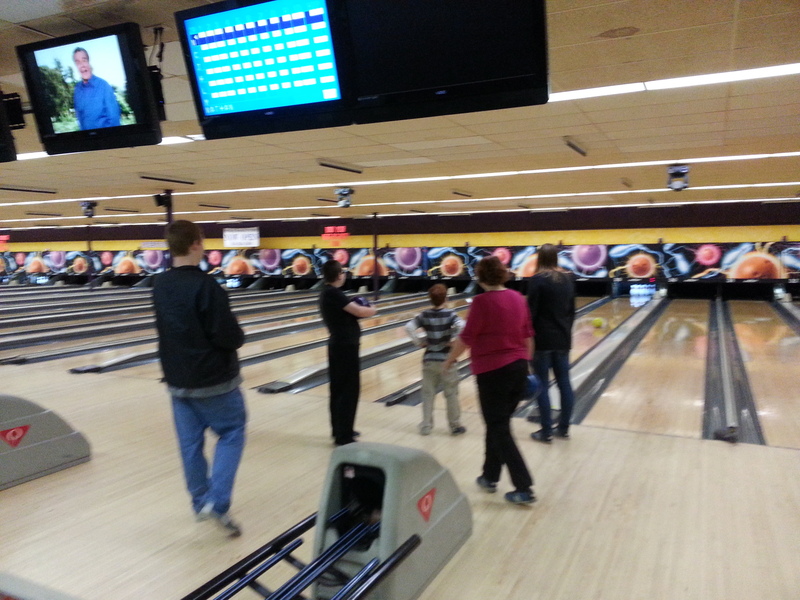 Here’s everybody looking to see if the pins would reset. 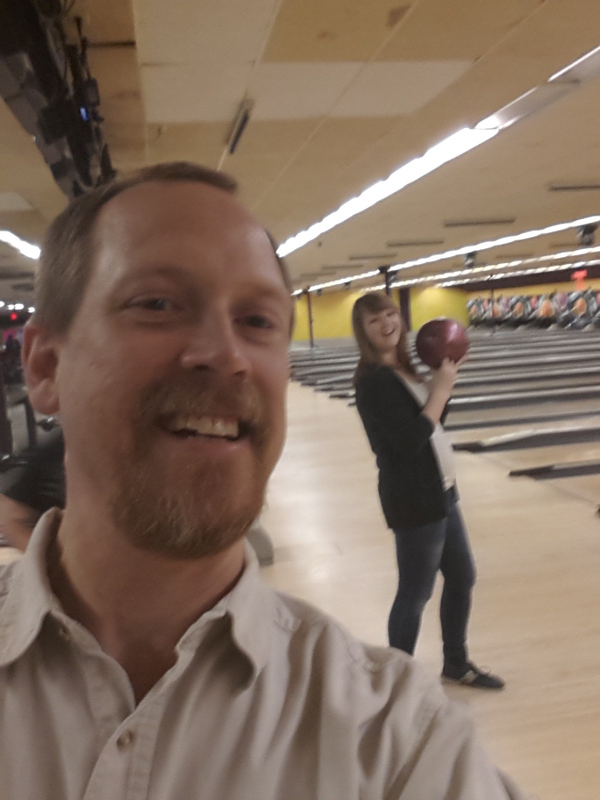 I even attempted a selfie (still learning) along with Hannah. 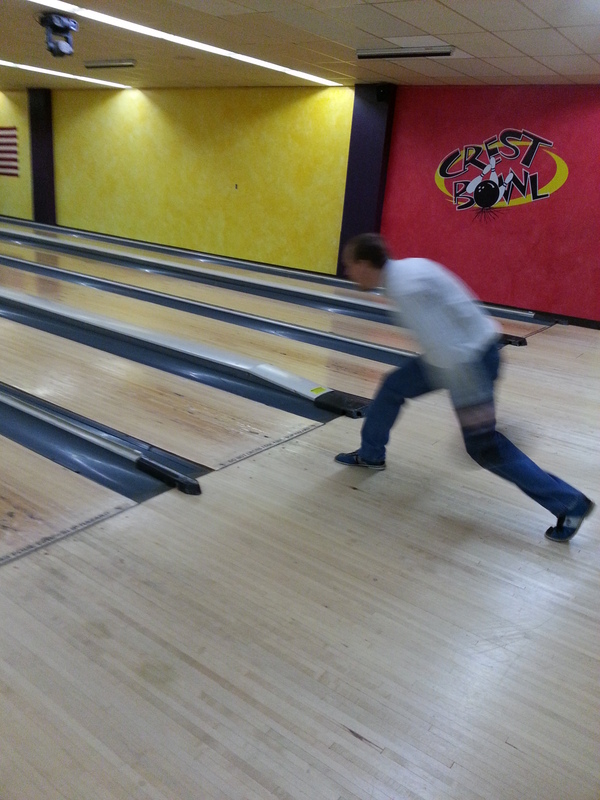 Hannah tried to capture my form – my camera just isn’t fast enough for my speed. Here’s the results of game 1. 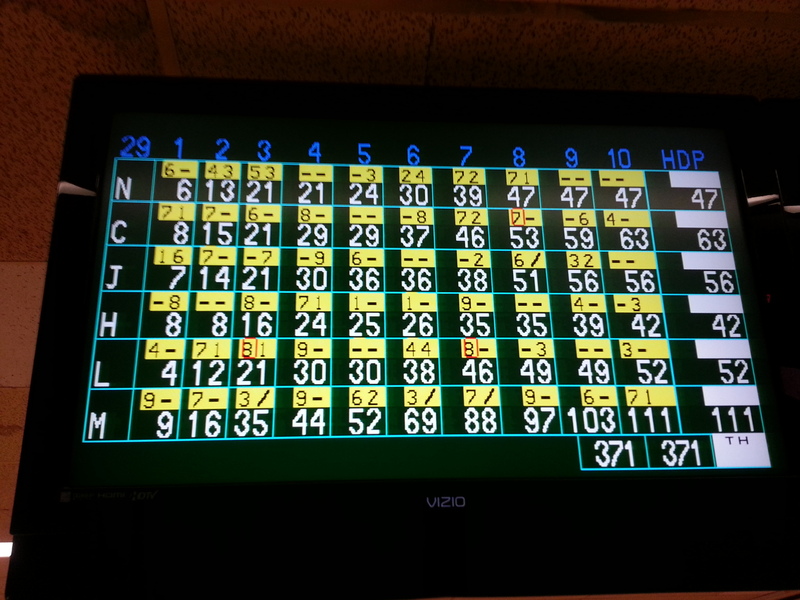 We were all pretty much done by the 5th frame of game 2, but we carried on – here’s the result. Nathan got upset and quit just before game 2, but after a little bit he came around. 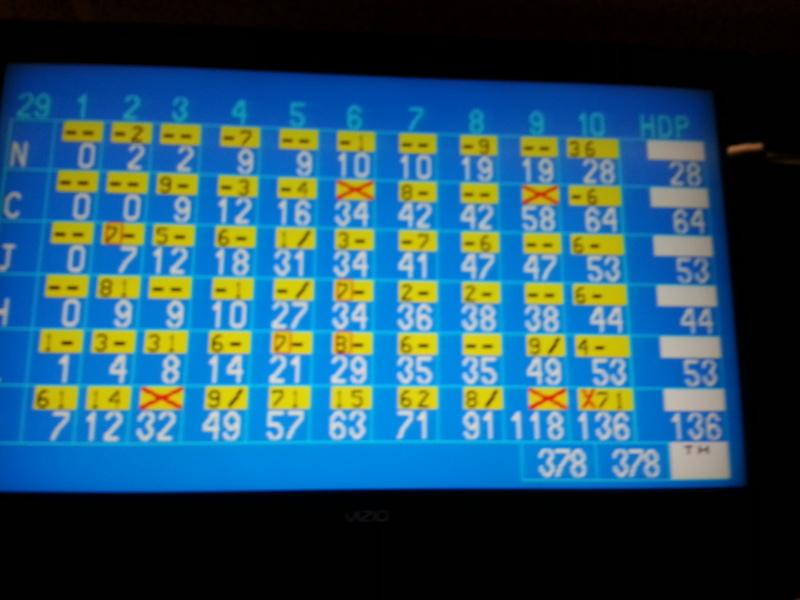 He decided that it was more fun to pick up and deliver each person’s ball than to bowl himself. So we used his turn for practice. 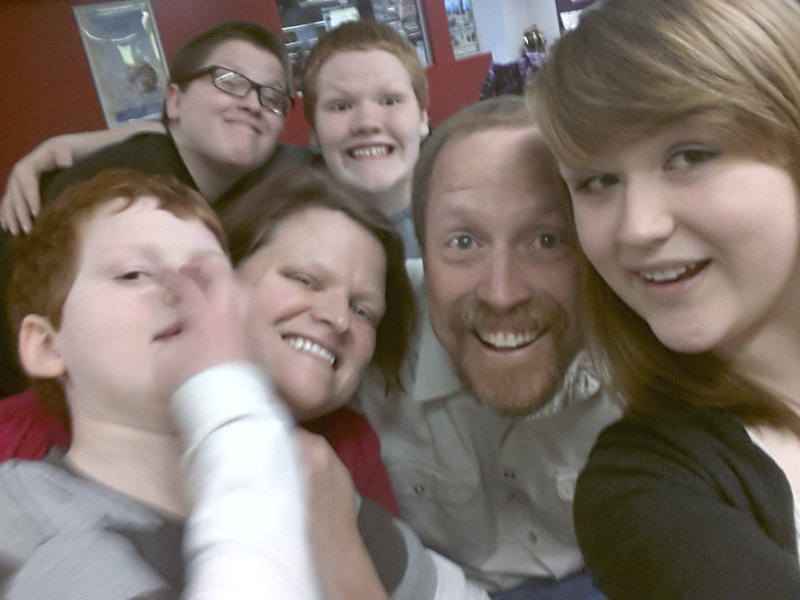 After we were done playing, Hannah showed off her mad selfie skillz. After that everybody wanted to take me to vStock since it was unanimous that I would enjoy said store. And since I don’t get out much, I had never been. 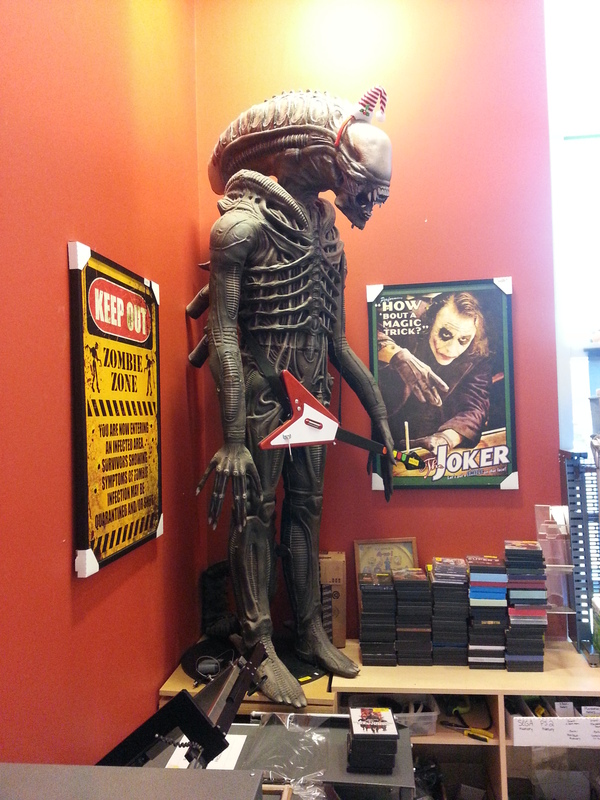 We perused the comics, books, videos, and toys. They had a huge screen with couches showing Dispicable Me 2. I sat down and watched for a little while. Closest I’ve been to a theater since 1991 or so. After that long excursion we finally headed home. And we ended the evening by jamming out to Rock Band. First it was just Joshua and me. Then Caleb joined and then Hannah. I sing, they play instruments – it’s really impressive to see those fingers dance along. It was an excellent day here at the Kelsey’s. Having blogs languishing around the Internet can come in handy sometimes. There needs to be a place where you can point people to see what you need to say. This family blog has been off and on for a number of years, so if you haven’t seen things in here, feel free to reach back into the photo album and take a look. But for the most part, you’ve come to this page because you were encouraged to take a peek. This year 2013 has had more than it’s share of surprises. Some of them have been expected (two kids in boarding school starting in August) and some of them not expected (Bambi’s mom vs. the minivan and a redo of the master bedroom shower before it ended up in the kitchen). In the midst of all of that, I’ve been invited to teach a class called Conflict Coaching and Mediation in Johannesburg, South Africa. I’ve raised some money from the church, and I’ve reached out to a few places to get some financial assistance – and now I’m down to just asking friends and family (and strangers on the sidewalks) if anyone can offer a little assistance. The process is pretty easy. Click the “Donate” button just below and put in how much you would like to send. If you stopped by here and can’t give, I completely understand. Times are tight these days. Just say a prayer that things will work out in God’s plan and know that is much appreciated. However, if you have $10 you can spare, we would be very grateful. You can donate any amount in the box when you click there (Update: I tested it for $10 using a Debit Card and PayPal gets $0.59 of that – I think if you use a PayPal account there isn’t a fee. Just in case you’re a nerd and you just have to know). As has been pointed out to me, this trip was voluntary. This is not an emergency, but it will help relieve some stress – mainly of the unknown. So if you can help out, thanks so much. So When Is This Trip? I’ll post more about the details of the trip as they get closer. But it’s just a couple weeks away. Why didn’t I think about this sooner? << If you are asking that question, you do not know me. At. All. Well, what have we been doing with our 2012? The first month of the year is over already. Time is flying. I have been trying to journal on Bible readings each day this year. I did pretty good for a while, but started tripping up at the end of the month. I’m going to get back on the ball. You can see how I did at 2012bible.posterous.com. As usual I have way more plans in my head than things going on. This month has actually been relatively quiet. Laura came downstairs and announced that today she officially feels old. Her birthday isn’t until next month though. But she just saw pictures on Facebook of the little boy that she watched in day care at Hillcrest. He just posted up photos of his first child. Generations just keep on coming. The boys have been busy facing a little bit of illness, playing video games, watching videos, and doing some homeschooling to balance it all out. The weather has been wildly sporadic, so there hasn’t been much in the way of snowball fights or sledding or anything. I’ve been doing a lot more sleeping lately. It’s late. We have our Dave Ramsey budget for February done, and I’ve even produced this post as a bonus – so I can head off to bed without a smidge of guilt. Joshua: I read that short people live longer than tall people. Uneasy eying around the table. Hannah: Well, we’re all dead. Silence, munch, munch, just a little smile from me. These people crack me up. Typically we don’t make a big to-do over most of our holidays. Things seem pretty much status quo for most of the day. However Laura usually cooks up a special meal. Independence Day (for us, that would be the 4th of July…) was no different. We had veggie hot dogs and burgers. We don’t shoot off our own fireworks, but this year Laura got a box of “safe” fireworks like Snap-n-Pops or the box said “Snap-its” or something like that. Basically black powder wrapped in wax paper. When you throw them on the ground they pop. We also had the little plastic bottles where you pulled the string and they would pop and throw trash on the floor. We went out in the afternoon and littered all over our patio. Nathan was very apprehensive at first, he wanted to be sure I was sitting next to him. Even at a young age, children understand the concept of a “human shield”. But as he saw that none of his siblings were loosing life or limb, he ventured out and with mom’s coaxing he threw down on some Snap-its. As we were finishing up we were wishing each other a “Happy Independence Day”, but for him the syllables just didn’t seem to fit together. He listened to what we were saying but the words just seemed foreign. He shouted out “Happy…” and now he was in trouble. Everyone was listening and he hadn’t figured out what that next word was. So his mind was racing and suddenly inspiration struck: “… Popper Day!” That got a big laugh. Until the evening fireworks. I’ve posted about previous 4th of July celebrations. We settled in on our little hill to watch 3-5 different township displays. We get to see more variety and we aren’t close enough to scare the children. About half way through, Hannah had mentioned or was discussing with Nathan about the “Grand Finally”. So with each explosion of light (and a little sound…) he would exclaim, “There it is! The Grand Finally!” followed with “Are we done?” or “Let’s go now.” It was worth it to stick it out, because with the Grand Finally in full swing his face lit up so much that Joshua was having us look at Nathan’s face instead of the fireworks display. The grand finally was truly grand. We then took our bug-bitten bodies home and tried to get to sleep with the hooligan’s in the field on the other side of the creek firing off their home cooked displays into the wee hours. Indeed, a cause for celebration. Here is a short (1 minute long) video of my car’s predicament. I suppose I shared in it too. This was from my phone, imagine if I would’ve had my actual video camera with me? Monday night I was driving up to Des Moines to attend a ministers’ meeting where one of the topics was going to be Biblical Peacemaking. I left directly after work and knew I wasn’t going to get in until around midnight. The weather was snowing, just like the weather across much of the country this week. Although it was snowing, it was so cold that the snow was very fluffy and blew around so the roads we bad, but not terrible. I did feel some sliding a bit along the way. Outside of Hannibal, I found myself behind a police officer. I has stopped to grab a burrito and was eating it. I thought that it would be safer to just stay behind him and wait until I had full control and attention before trying a passing manuver. But the officer kept slowing down and slowing down. I would’ve almost had to come to a complete stop not to be following him closely. Finally he was doing about 20 mph (which I thought there was a minimum speed on highways… whatever) and he put on his blinker and pulled to the shoulder so I had to pass him. When he pulled back on, I figured I was in trouble for following him, but I just saw him fade away in the distance. Later, up on I-80 in Iowa I was driving behind a semi. I saw another semi off in the ditch on the right. There was an off ramp to a rest stop there. The semi in front of me wanted to get off but didn’t want to sideswipe the other truck in the ditch so it weaved out into the fast lane to then make the exit. As it did so it fishtailed a bit and I moved into the passing lane hoping it would get by. I started tapping the breaks at that point. Then I realized he wasn’t getting out of the way very fast and was basically blocking both lanes. I wasn’t going to have enough distance left to stop. So I tried to move into the median shoulder and hope to squeeze by. But the shoulder was slippery and I started to fishtail too. So I had to choose between swinging right and smacking into the back of that semi or swinging left and possibly loosing down into the median valley. I chose the median. Two patrol cars arrived from different directions and they told me to just turn off my hazards, lock it up and get in their car. They had no intention of pushing my car in the middle of the night on the highway. I found out in the ride to the hotel that there was a towing ban due to the bad conditions. I had never heard of such a thing. I probably wasn’t paying attention because I need a tow so very rarely. (The last time was our stay in Bethany). So now I can add Grinnell to my list of little memorable towns. The pastor from Newton came and picked me up and brought me to the meeting in the morning. When it was time to go, he brought me back to the towing company and I picked up my car and drove back home. As the new year dawns, we’re all at home. We didn’t travel anywhere for the holidays. Hannah has been home from academy for a couple of weeks now. And like a New Year’s in the recent past, we’ve had a flu-like bug floating around in the air. Nathan got it first, then Caleb, Joshua, and I’ve been doing battle with it for about a week now. Hannah and Laura have evaded the effects. We had an opportunity to meet Hannah’s first boyfriend who visited with his family at our church on New Year’s Day. I didn’t get to talk with him for more than 20-30 seconds. It was communion which is always hectic. Come Monday we will all be back into the standard routine. I’ll be back at work. I’ve been at the same client for two years as of January 12th. That’s a long time based on some of the contracts I’ve had in recent years. And the boys will be back in home school. This weekend does start a 40 day season of prayer at church, and that will keep us busy right up into mid-February. As always, always on the move, and more news as it happens. 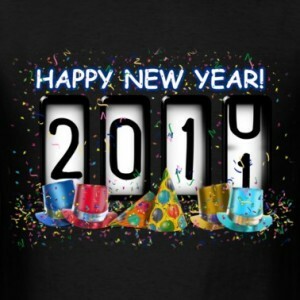 We look forward to sharing as 2011 rolls along. No – I’m not reduced to holding a cardboard sign on the street corner. Hoping for Changes is a state of mind. There’s an aphorism (I am quite fond of aphorisms … aphorisi?) known generally as BE – DO – HAVE. What is it that you really want? That’s a good question in itself, but once you get a handle on it what do you have to do to obtain that thing? The deeper question is, what kind of a person do you have to be to do that thing that gets you that thing that you want? A great example of this is given by a vMentor of mine. By vMentor, I meant ‘virtual Mentor’. I learn from people I’ve never met. You see, they leave these things lying around called books (and now PDF and MP3 files…) that you can learn from… So anyway, this vMentor’s name is Jim Rohn. He expresses this BE – DO – HAVE concept this way. He says that you should decide to become a millionaire. Why? Not for any greedy reason. In fact, if you so choose, once you become the millionaire you can give it all away and become a philanthropist. The point isn’t the money. The point is, what kind of person do you have to be in order to be a millionaire? You have to be a person of action, a person of discipline, you have to be able to get along with and team up with other people, you have to be an achiever and a dreamer. You see? If you become all these things in the march to millionaire-hood, the becoming is the real reward. Oh before you get all crazy on me (actually go crazy in me, just do it in the comments), you can also marry into money, you can steal money, you can miser your way to a million. However, is that the way you want to do that? What have you become by taking such a road? This just illustrates the point further that it’s the BE’ing that is the key. There’s nothing immoral about being a millionaire, but there are immoral characters that are. In the same way that there are really quality people who have become millionaires. I think you get the point. And the point wasn’t about becoming a millionaire… right? But there are actions that I can take to push my world of ideas out to others though various channels. This blog post is just one avenue of many. But even that sharing is a step of action. It takes discipline. I think I’ve consistently produced a podcast for 6 weeks. I’ve blogged consistently for 3 or so weeks. I’ve worked on two different books off and on. And as my mom’s pointed out on Facebook, my history of ‘not doing my homework’ is almost legendary. I’ve spent a decade changing the way I think (2000 – 2010), now I need to get into changing the way I act. So instead of trying for sustained, persistent, focused action. I’m going to start with random but regular action. I’ve been looking for that one perfect sniper rifle shot to where I want to go. The planned rocket trajectory isn’t going to work for me. So I’m committing to the broadcast seed sowing style. Oh wait, I mixed my metaphors didn’t I? I guess I should say: I’ll drop the sniper rifle and opt for carpet bombing. Hows that for violent action? Stay tuned, I’m sure there will be updates to this news story. And if you don’t even know what I’m talking about, that’s OK. Half the time I don’t even know what I’m talking about. The key’s in knowing which half is which. Blog post accomplish – what can I do next? Oh, hey, why don’t you take some action today? Why don’t you leave a comment here? That’s a novel idea, I mean you just spent all that time reading this… what do you say? The Kelsey's Copyright © 2019 All Rights Reserved .